As my oldest daughter entered Junior Kindergarten last week and my youngest entered her child care centre, I officially became immersed in the world of early learning programs. My first real eye opener was the fact that almost all assessment in child care programs and kindergarten is done through observation and based on children’s oral language. For educators, this means A LOT of documenting. 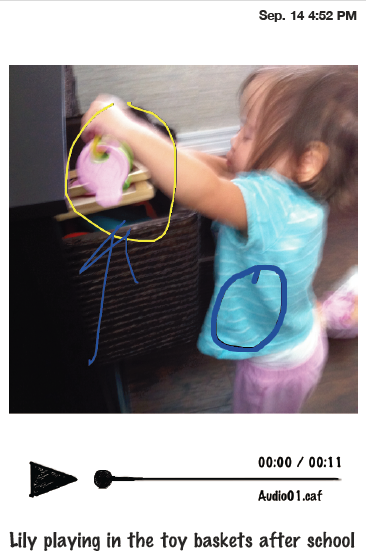 I noticed in my youngest daughter’s childcare program, they document by taking many pictures and writing down anecdotal notes for each pictures with the style of learning (ie. visual, auditory, kinesthetic). They told me about the large amounts of time that goes in to this kind of documentation. My immediate thought was how technology could be used to effectively enhance this process of assessment. There must be an app out there somewhere that could help with this kind of documentation. Well, the other day, I was speaking to the Early Learning Program Consultant in our board and such an app exists! It’s called Mental Note and according to the website, it combines pictures, voice recordings, sketches, and text all on the same page. So if a student is demonstrating some style of learning, I could take a picture, audio record what I am observing, annotate the picture using the pen feature, and add a few words of text to briefly describe what the student was doing. All of the notes taken can be stored on the iphone/ipad/ipod touch but the notes can also be e-mailed as a PDF with the audio as a separate attachment or backed up in the cloud to your Dropbox account. I installed the Mental Note Lite app for free (but only comes with a maximum of 2 notes) to my iphone and tested it out and I was very impressed. The full version costs $2.99 and comes with unlimited notes. Here is a sample of a note that I quickly took of my daughter playing (without the 11 second audio clip).